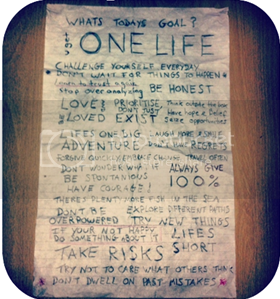 My friends thought you may like to know why I created the Life Manifesto and the story about how it came about. I created the life manifesto just over 2 years ago after a number of painful incidents happened all within a short space of time from each other. After feeling sorry for myself for a few weeks I sat down and created a list of positive terms that I could refer to throughout the day to give me the ‘get up and go’ attitude towards life, to help motivate me and inspire me to become a better person each day. This was my life manifesto! I had just scribbled down a few phrases on an A4 piece of paper and stuck it up in my room to refer to, to help me if I’m honest just actually get out of bed in the morning and start doing things. But straight away I actually started to make different decisions and alter the way I thought about the choices I came up against. I started applying for jobs, not just in my city, around my family, my comfort zone, my ‘home’, but in other countries. In countries where I could make a real difference to people. I also thought of my scariest fear ‘flying’, and booked a parachute jump for my 32nd birthday. And to make myself go through with it I got sponsored to do it by my friends and family and raised £670 for a local hospice, which I’m truly proud of! But best of all I got offered a job to be a teacher in Thailand and decided to seize the opportunity and take it, which turned out to be the best decision I have ever made! I decided to create the manifesto properly, and with the help of my friend Nat who works at a local t-shirt printing shop altered it slightly , computerised it and had it printed in a larger scale so I could have it framed up in my dining room so each morning while I ate my breakfast I could read it through. I thought the end product was really striking and I am really pound of it! These were huge alterations I had made all within a number of weeks, but as well as huge alterations, daily I was making small changes too. Such as dancing first on the dance floor at a 30th birthday party, I even walked back into a bar, to give a guy I was talking to my number. I didn’t hear from him, but at least I wasn’t left wondering ‘what if’. The life manifesto was changing me. I read it every day and subconsciously I was believing what I was reading! Within a few days I had my family and friends visit asking where I had bought ‘the art’ in my dining room from, and where they could get it. I told them I had made it, and got Natalie to help me get it printed and framed. They all really liked it and asked for copies to be made up by Natalie, which I had no objection too (if anything I was really flattered they liked it!!). I love it here and each day I’m trying new things and experiencing a different way and attitude towards life. Here it’s not about working to get paid, then spending your wages on a loan you got from the bank to buy a house and doing this repeatedly for 30 years until you eventually pay it off, but by that age your too old to do the things you want to do in life without the constrains of money and reasonability’s. I’m not turning into a hippy, honest! I just have a completely different outlook on life now. If I’m going to give any advise it would be try not to have regrets, don’t use that awful word ‘if’. “If I did this, maybe I should have done that”. I now hate this word. Be definite in your choices! If you make a bad call make it 100%. Don’t make it 50%, so it gives you the option to look over your shoulder saying “I should have done it this way, I could have done this”. Make it 100% then at least you know you tried your best and gave it your all! How onelifeposters.com came about . . . I have just recently been back in the UK attending one of my oldest friends wedding as a bridesmaid (Sophie I love you!) and have had such a great time catching up with everyone. I saw an old friend of mine Chris who had seen the Life Manifesto at another friend of mines house. He seemed to think others would really enjoy it and suggested I should create a website to sell it. I pondered about it for a few days and came to the conclusion that if others gain from it and act upon the opportunities they come across just from been motivated and driven from the Life Manifesto then I should! So with help of my brilliant friends back in the UK we have created this website to offer others the opportunity to get their own manifesto. I’ve found it touches each person differently! If you have a copy of the Life Manifesto please send us a picture of it in your room or office, and tell us how it’s affected your thought path. I’m sure the guys who look after the website for me will do their best to get them all posted up on our Facebook page & Tweet them to our followers! Whatever the reasons you use the Life Manifesto for, I hope it helps guide you to make clearer positive decisions in your life plan or daily routine. “Don’t be afraid of change, life is short, you only get one so make it as good and happy as possible”.